Magic (magick) has been around at least as long as written history and possibly longer. There was always that one guy (or gal) who had the power of mysticism. Helping the pharaohs, birthing babies and healing the sick. Over the last 1000 years or so, magic has been frowned upon. This was especially true in the 16-18th centuries. So what changed? People needed a scapegoat for everything gone wrong in their lives, and due to the surge in puritanical Christianity across Europe and the new America, the Devil was the biggest bringer of malevolence. However, the Devil doesn't exist in the physical world (I'll leave it to you to decide if it exists in other realms) so they needed to look for someone in the physical realm to cast the blame on for things such as chicken pox, dying cattle, stillbirths, bad crops, epilepsy, etc. So that happened to fall on the witches of the town - the wise women, knower of things, spell-casters. And unfortunately, when things turned to sheer hysteria, many people who were merely outcasts were accused of witchcraft, too. But today, in a somewhat saner world, women are reclaiming their intuition, their power of knowingness. They are looking to get back in touch with their wild side, that moved with the phases of the moon and created, or sought out those who created their own magic. I explain it like this. Magic is simply manifestation with props. Magic is taking an intention - let's say the desire for more money because you have to pay your taxes - and bringing forth more than just your intention to make it manifest. In order to do this, first, you need a spell. So if you haven't been passed down a Book of Shadows or are well-versed enough to have created your own spell, maybe you have googled one or downloaded a book of spells from Amazon (<--affiliate link). Then you go about gathering your supplies. I am a hedge witch, so my magic almost always contains herbs. My spell would consist of herbs, a green candle, and an attraction oil. Planetary energies enhance magick work so you would want to find the best day and time to work the spell. Jupiter is the best planet to leverage for prosperity magick, so Thursday, which is ruled by Jupiter, is by far the best day for money spells. If you cannot wait until a Thursday (or to beef up the spell even more on a Thursday), look at the planetary hours for that day and cast the spell during an hour ruled by Jupiter. I will write more about planetary hours in the future. When the hour is right, it is important to cleanse your space to remove any unwanted energy. Prior to any magick or spiritual work you want to protect yourself. For magick, I like to cast a circle. This protects myself and work and also keeps the energy that I am working within the circle. Call on angels and ask that they stand guard and protect the four corners (east, south, west, and north) and to lend their power and strength to the spell if they would. Now you call upon the energy of the "props" of the spell and get started. For my money spell, I use the energetic properties of the color of the candle (green for money), the power of the herbs that are tied to the quality of money, and of course the vibration of the attraction oil to bring me what I desire. And remember we are also using the day of the week or specific hour to lend its energy as well. Next, I use the power of my words as I speak my desires to the Universe. Some people will call upon a specific deity, but I personally call on Mother/Father God and petition for assistance. It is important that you use words that you are comfortable with. Finally, and maybe the most important, is to use your mind. The number one rule in magick is that you believe. I pull up energy from the heavens and the earth and bring this energy into my body and then light the candle. I then let it burn as I envision myself receiving the amount of money I need (but I also think to myself or say "this or something better." You have to feel it, see it, know it to be true. If I am mixing my herbs, I put this intention and energy into the herbs as I mix them, too. When my thoughts are complete, and I feel certain that this will come to pass, my job is done and I give thanks. Magic (magick), or spellwork, is just a ritual of manifestation. 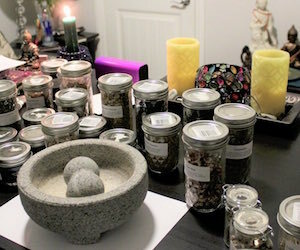 No matter if you are casting spells for money, to find a new lover, cleansing and protecting your home or if you are creating herbal folk remedies. The magic is in you, but it is also in all these wonderful things around you. Energy is power, and every single little thing on this planet has its own unique energy or vibration. In magic, you are working to create a vibrational match to what you desire. So that is why in my money spell I pulled together a green candle for money and the Jupiter hour which rules prosperity, luck, success, investors, generosity, and banking. I also hand-picked herbs tied to money like cinquefoil and basil, that are a vibrational match. It's like building a cake. One layer is nice. but a four-layer cake is freaking awesome! There really is nothing scary or dark to it, unless you just want to be scary and dark. It is your intentions that make it so. You can be as dramatic or undramatic as you want to be, it's entirely up to you. Some people really like to get into character, while I look more like a middle-aged boho hippy gal than what most people think of as a witch. You have to find what makes you happy (as it harms none) and what feels well with your soul. Making magic is something anyone is capable of, and if you ask me, there is a bit of witch in every woman. Now go make your own magick! 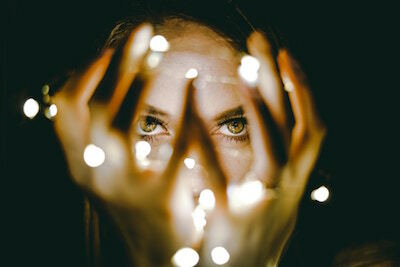 If you do not want to go it alone, I offer Custom Magick Spell sessions where I create the spell & kit for you OR I can even go one step further and cast the spell for you as well.